In the late summer of 1996. YES 20 years ago almost to this day! The idea of an Ice Shanty on the world wide web popped into my head. I knew a little about ice fishing and was really fascinated with the world wide web which was just beginning to explode. Being addicted to ice fishing, I could hardly wait for late fall and first ice to come every year so I decided I'd try building an ice fishing web site that could "get me thru the summer". The Shanty was born, as it was called for the first the two years. The page had a few pictures and some tips. Without anyway to find the page it somehow ended up with 3500 hits the first January it was up! I was like wow there are tons of people just as insane about ice fishing as me! Peeps would visit the page and started emailing me their tips and pictures to me and I would post them. Soon this was too much to handle and the domain name Iceshanty.com was procured, forum software was implemeted. Now ice fishers from anywhere could discuss all aspects of ice fishing, share their photo's, video's or simply shoot the breeze with a fellow ice fisher. Even after 20 years I'm still amazed at the many many species of fish that iceshanty members go after and how the styles, techniques and tactics varied from area to area. I still laugh at myself remembering reading in the early days, guys were posting out east about "traps". Me being from the midwest I had never heard that term trap as we call them tip ups here. That was the first thing I learned here and have learned and laughed a whole bunch more since then. After last years short time on the ice I'm chomping the bit for a much colder and longer ice season. The early forecasts for winter are much more promising for good ice this winter than last year so bring the deep freeze on! 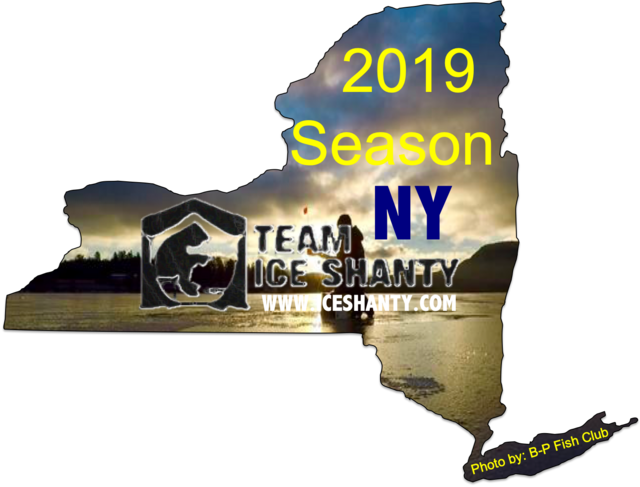 Looking forward to this season with more anticipation than ever and I hope every iceshanty ice addict here gets their fill of ice time this coming season! Thanks for everything you've done and created Scott! As a new member, and ice fisher, this site has been invaluable to me! Alcoholics have AA--- We have IS!! Thanks Scott!!! cool info indeed and a big thanks for doing it! Wow! I never realized just how old this site was. It's pretty cool to go back and read the older pages and all of the stuff that has changed, and even some of the old tricks that still work today. Thanks for creating a site that us diehard ice freaks can use throughout the year to get our fix! I'm an addict and this site helps with the withdrawals of not being on the ice! I wish ice fishing would last for 9 months instead of 3-4 each year, and the last few years have been much shorter than that even. I sure hope this winter lasts a long time. Just want to say Thank You for creating the site Scot!! Many of us here share the same passion/addiction as you do. The wealth of information shared here from members has undoubtably helped me become a much better fisherman and continues to do so on a daily basis. Happy Birthday ! Scott thank you for creating this website I've learned many things since becoming a member and also have met and fished with a few other members. May Ice Shanty continue to grow and be around to reach it's 40 TH birthday. Scott, thanks for coming up with that crazy idea! Happy Birthday to IceShanty and many more to come! Awesome website!!! Here's to 20 more years! Happy 20th birthday ice shanty and many more, great website, thanks scott. My short time here has been life-changing. I do not write a lot, but i sure like to read a lot. Sometimes the crazy cyber world we live in is too much, but never too much for IceShanty.com. Thanks Scott, it has been a pleasure to be a regular on this site! Thank you for a great site Scott!!!! Haven't been here for even half of it, but loving every minute of it! A truly fantastic web site. I've gained so much knowledge here and that is what makes the sport of ice fishing much more enjoyable. Thanks again! Thanks Scott for all you have done as well as the multiple moderators and IS regulars that have been here ...forever!! Thanks Scott for all you do. wow! its a great idea to have a"ZUCKERBERG MOMENT" fo sure!thank you Scott and be blessed for 20 more. Haven't been on here long, but what a great site! Been on here for 15 years and its the best site ever. Thanks Scott for such a great site and all the things you do. And for giving The Goatboys a place to call home!! Congrats on 20 years Scott!!! Time sure flies. Glad I found this site 14 years ago. Have learned a lot from here and made several new friends. Kind of funny looking back just 10 years ago and seeing videos I posted. I made 2 viewing formats on several of my videos... dial up or broadband. Happy 20th Scott! I wouldn’t have learned as much or had nearly as much fun over the years, Thanks for not only acting on a great idea but also for everything you and the moderators do to continually grow and improve an awesome site.